Seattle has over 90 unique neighborhoods. 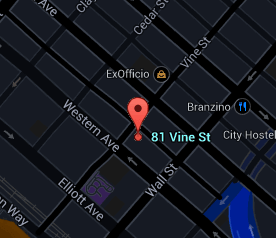 The location of 81 Vine is in the area known as Belltown. With Pike Place Market to the south and Queen Anne to the north, Belltown has transitioned into an eclectic neighborhood with a mix of world class restaurants, quaint cafés and locally owned boutiques. 81 Vine is just moments from several Seattle Waterfront activities including the Seattle Ferry Terminal, Seattle Aquarium, Myrtle Edwards Park, and the Seattle Great Wheel. You can't beat the easy access to the Olympic Sculpture Park, Seattle Center and Seattle's Central Business District. Black Bottle is a casual tavern with dishes made fresh-to-order using local and sustainable ingredients. Branzino is a Seattle neighborhood resultant with Italian influences and an affordable wine list. Plenty of shopping with Cost Plus World Market and Charteuse is within blocks of 81 Vine. With all of this just outside your front door, this is the Belltown lifestyle. Every building has its own personality and attributes. The community is an important aspect of city living and can have an impact on how integrated it is with the residences. The 81 Vine building features can be explored here. A full list of amenities within the complex is displayed to help understand the offerings of the project. Originally built in 1914, 81 Vine was renovated in 1999 by developer and architect Carolyn Geise. During the renovation the top 2 stories were added to make the building a 5-story brick mid-rise. The building consists of only 20 units offering studio lofts, 1-bedrooms, 2-bedrooms and 2-story lofts with the majority of the homes offering the original exposed brick walls and high ceiling. The cylinder shaped sculpture near the entrance was designed by Buster Simpson and is attached to the building's gutter system. This sculpture has bio-filtration system and was designed for residents to use to water plants growing on the community rooftop terrace. All active, contingent, pending, and sold listings for the 81 Vine building. The Stroupe Group specializes in downtown Seattle condominiums. All the articles that have been published by the Stroupe Group concerning 81 Vine and Belltown can be found here.